KABUL, Afghanistan -- Afghan officials say the attack on a tunnel complex in eastern Afghanistan with the largest non-nuclear weapon ever used in combat by the U.S. military left 36 Islamic State of Iraq and Syria (ISIS) fighters dead. There were no civilian casualties, according to the Ministry of Defense statement, which also said several ISIS caves and ammunition caches were destroyed. U.S. officials said precautions were taken to avoid civilian casualties. The ISIS commander in the area was among the dead, Afghanistan’s presidential palace said. But fierce opposition among Afghans also surfaced. The bomb, known officially as a GBU-43B, or massive ordnance air blast weapon, but also known as the “mother of all bombs” unleashes 11 tons of explosives. When it was developed in the early 2000s, the Pentagon did a formal review of legal justification for its combat use. The U.S. military headquarters in Kabul said in a statement that the bomb was dropped at 7:32 p.m. local time Thursday on a tunnel complex in Achin district of Nangarhar province, where the Afghan affiliate of ISIS has been operating. The target was close to the Pakistani border. A separate non-nuclear weapon known as the Massive Ordnance Penetrator, or MOP, which is larger in its physical dimensions but carries a smaller load of conventional explosives, is designed to take out deeply buried targets like reinforced bunkers. The MOP has never been used in combat. 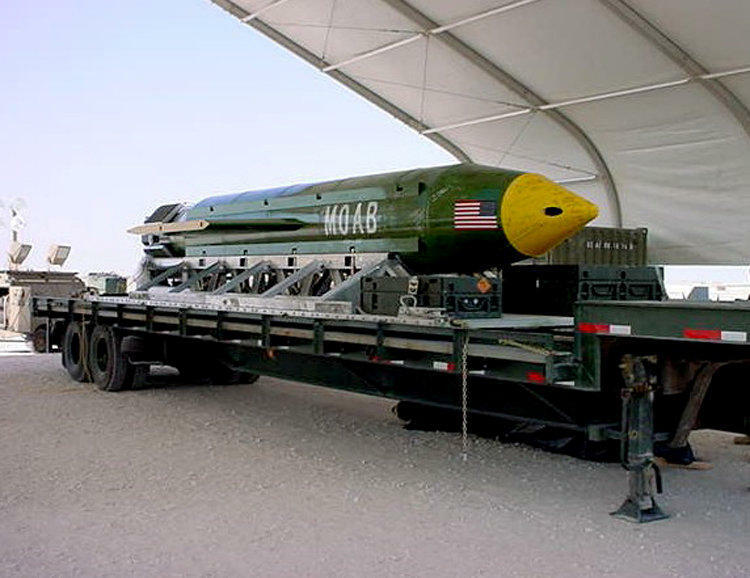 In its 2003 review of the legality of using the MOAB, the Pentagon concluded that it could not be called an indiscriminate killer under the Law of Armed Conflict. Army Gen. John W. Nicholson, commander of U.S. forces in Afghanistan, said in a written statement that the strike was designed to minimize the risk to Afghan and U.S. forces conducting clearing operations in the Achin area “while maximizing the destruction” of ISIS fighters and facilities. He said ISIS has been using improvised explosive devices, bunkers and tunnels to strengthen its defenses. White House spokesman Sean Spicer said ISIS fighters had used the tunnels and caves in Achin to maneuver freely. “The United States takes the fight against ISIS very seriously and, in order to defeat the group, we must deny them operational space, which we did,” Spicer said.